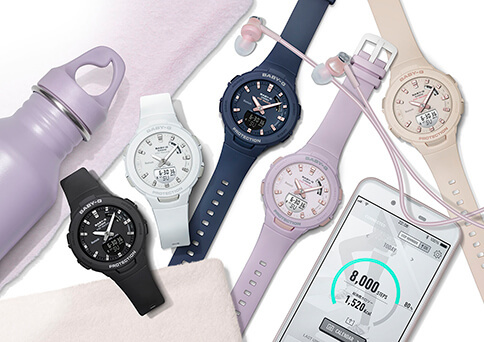 A fitness watch with the Step Tracker and Bluetooth Mobile Link features, the all-new Baby-G BSA-B100 is the first Casio Baby-G model equipped with Bluetooth. The BSA-B100 will debut with five colors: BSA-B100-1A (black), BSA-B100-2A (navy), BSA-B100-4A1 (beige), BSA-B100-4A2 (pink), and BSA-B100-7A (white). The BSA-B100 has the same fitness features as the G-Shock G-SQUAD line such as the pedometer with a daily step goal setting, a 200-record stopwatch memory, and the custom interval timer (up to 5 custom timers auto-repeatable up to 20 times). One feature the Baby-G BSA-B100 has that the G-Shock G-SQUAD models lack is the step reminder function that will display a notice and beep when a lack of activity is detected. 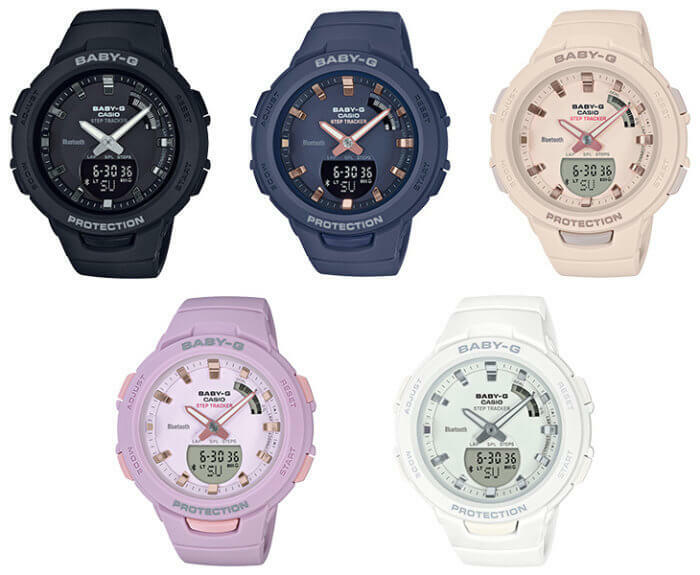 The Bluetooth Mobile Link function allows the user to view the step tracking data on the Baby-G Connected app as well as adjust the watch settings and keep the time automatically synced. The BSA-B100 measures 49.6 x 41.4 x 12.6 mm and weighs just 35 grams. Other features include shock resistance, 100-meter water resistance, 5 alarms, dual time, auto dual LED Super Illuminator light with afterglow, and an estimated 2-year battery life. The BSA-B100-1AJF, BSA-B100-2AJF, BSA-B100-4A1JF, BSA-B100-4A2JF, and BSA-B100-7AJF are scheduled for a 7 September 2018 release in Japan with a list price of ¥15,500 JPY each. The BSA-B100 series is also a September 2018 release in Asia. Hi – Where can I buy BSA-B100-4A1 Biege for women. I live in Las Vegas Nevada. Is this already available in the Philippines? Hi! I live in Colorado, ordered the watch from Spain. I couldn’t connect it with the baby-g connected app. Is this related to the fact that it hasn’t been released to USA yet? Thank you!